No printing, printing month, or printing number line in book. Copyright © 1973 by Total Effect. The Star Thrower is credited to "Loren Eiseley" not "Simon Eiseley" as shown in Contento. Full credit is "From The Unexpected Universe by Loren Eiseley, © 1969 by Loren Eiseley. 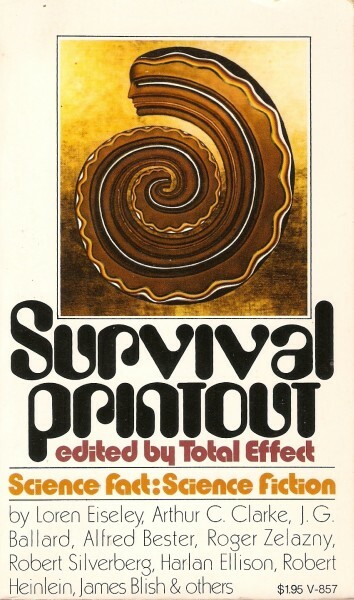 Reprinted by permission of Harcourt-Brace Jovanivich, inc."
Below "Total Effect" on title page is Leonard Allison | Leonard Jenkin | Robert Perrault. The Editors states "Total Effect" is an educational organization. Leonard Allison, Leonard Jenkin and Robert Perrault are given brief biographies in the last part of the essay. Cover artist not credited in book. Signature not found.